Spring has sprung, and in Houston, TX that means a torrential downpour of rain is on the horizon, followed by an ungodly amount of heat. Showers will be ruined in a matter of seconds, seatbelt buckles will burn our hands and legs, and air conditioners will be pushed to their absolute limit in the ongoing fight against the sun. Oh, and don’t forget the onslaught of pollen. Okay, okay there’s no reason to be a completely cynical “Negative Nelly”, this time of the year is truly wonderful in its own light. The rebirth of the Earth is a repeating miracle that shows us life all around us and how that life interacts with each other. Two Texan staples, Bluebonnets, and Indian Paintbrushes begin to reemerge and nature once again shows us the wonder and beauty that is all around us. I guess that pollen isn’t all bad after all. But the fact remains that the heat is still approaching and approaching quickly. We are always proponents of adding residential HVAC maintenance as a part of your spring cleaning to-do list. This specific, seasonal deep cleaning/maintenance is the perfect way to get your air conditioner ready for the task of fighting the Houston sun as it shines down in all of its glory; however, it is also crucial to realize the importance of non-season HVAC maintenance. Combining the two is a surefire way to lessen the load put on your air conditioning unit, all while maximizing not only its potential but also your air conditioner’s life. Our guide to spring and routine maintenance for your air conditioner will show how to save your home’s HVAC unit from unwarranted stress and help prevent against a major breakdown, whether it’s 102° or 42°. The two most recommended times to examine your residential HVAC unit are the in spring to prepare for the summertime heat and again in the fall to set your furnace up for success against the harsh winter temperatures. Now, while that last part might not make sense to many residents of Houston, considering we are spared massive blizzards and icy roads for the most part, but thanks to that pesky humidity, those few days when the temperatures drop, you’d be a liar if you didn’t say you weren’t thankful for the warmth your heating and cooling system provides. HVAC system. It is the equivalent of the home’s flu shot. Preventing seasonal ailments before they occur, but what about regular check-ups? In the same manner that one may visit a doctor’s office to ensure everything is still functioning correctly, providing residential HVAC units with routine maintenance in addition to seasonal, produces many positive results for both the inhabitants and your home’s air conditioner. Replacing a small part? Annoying. Replacing an entire air conditioning unit? We can’t type how one really feels, this is a family-friendly blog, but we think you get the point. Providing your residential HVAC unit with access to qualified, licensed professionals more often than twice a year can help spot smaller issues before they become larger ones, saving you time, money, and the stress of an untimely breakdown. Energy bills, no matter how large or small your home may be, are seemingly never low enough. Spring maintenance will help your air conditioner keep your energy bills low in the most harrowing time for your AC; however, for year-round efficiency, a routine maintenance program is needed to ensure your energy bill is not only lower, but you’re also receiving a better overall product. Debris can build up over time inside of your home’s unit, and when neglected, it can cause additional strain on your unit causing it to not only fail at meeting its optimal performance but also use more energy than is needed. Having your unit routinely cleaned will help you save on energy costs as well as reduce stress on your HVAC unit thus expanding its lifetime. The cleaning of your home’s residential HVAC unit will also produce improved Indoor Air Quality (IAQ) for you and your family. Let’s take a step back and reconsider that most seasonal maintenance plans are suggested to be implemented in the spring and fall seasons to protect for the season to come. Let us also reconsider that we have pointed out that pollen comes in the springtime. So why wouldn’t you prepare for this season in the winter to help your unit filter out as much as possible before it becomes a problem? Moisture control and humidity control are some of the more overlooked aspects of a home’s air conditioner. A lapse in proper moisture control can lead to mold and further decrease your home’s Indoor Air Quality. Adding a regular maintenance plan for your AC unit can help improve the literal air you breathe and quality of life within a household. The combination of both seasonal and routine maintenance for a residential HVAC unit is the right choice to truly get the most out of your home’s AC. 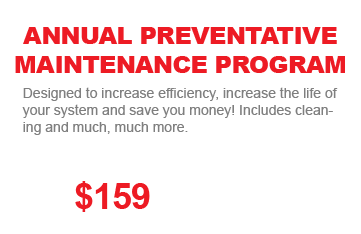 Spring maintenance is perfect to prepare for the biggest usage months of the year but we can see that year-round protection can not only help our air conditioners but also improve our lives. Curious about adding a regularly scheduled maintenance plan for your residential HVAC unit? Speak with the highly qualified technicians at Cruz Air & Electric. Our team has humbly served Humble and the surrounding areas within the Houston Metro since the 80’s and pride ourselves on keeping home’s HVAC units running better for longer. See what we can do for you today!